It is mid-day of the mid-summer day in the Balkans. And it is hot. 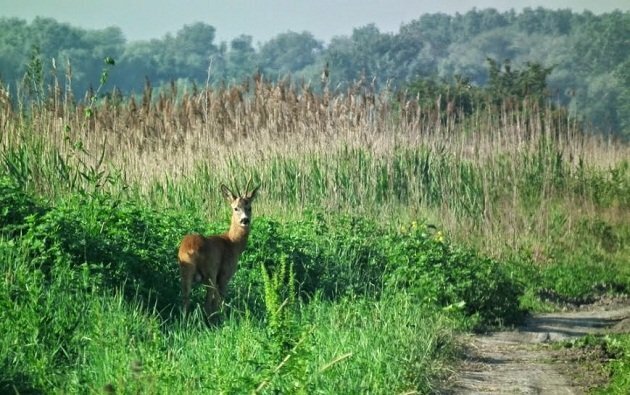 My wheels are rolling down the dirt track in the Carska Bara Ramsar site, through the meadows and arable fields interspersed with depressions filled with water and overgrown with reeds. 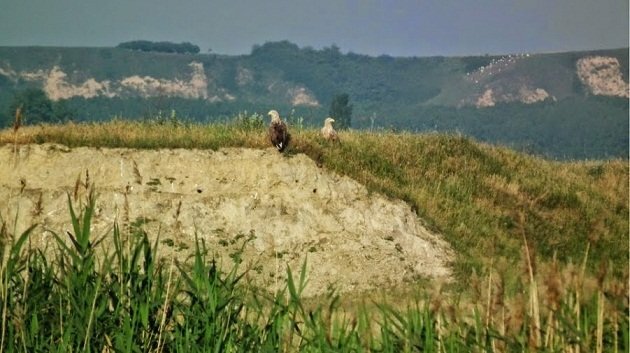 A small flock of European Bee-eaters is in flight around their nesting hillock and on the hillock – stands a pair of adult White-tailed Eagles! We are closely followed by a cloud of dust and every time we brake for some bird, that cloud maliciously overtakes and envelops us. The road is lined with European Stonechats, Red-backed Shrikes, Corn Buntings and Eurasian Skylarks. 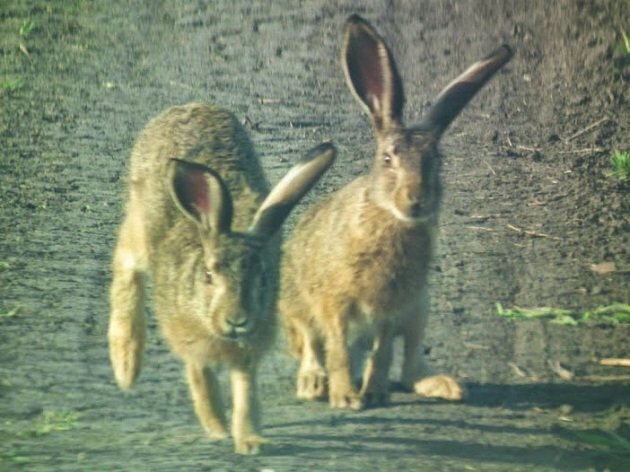 Several Eurasian (Western) Marsh Harriers later, two clumsy young European (Brown) Hares are hopping towards us and then, in surprise, suddenly stop right in front of the car, only to retrace their steps back. We are in the reserve buffer zone and around us are wheat fields. This is a lowland area in the Tisa River flood plain and despite the dikes that nowadays prevent flooding, somewhat strangely – reed grow as weed among wheat. By the roadside, one young Roe Deer buck is checking on us. The merciless Sun is scorching the earth and yet, a Eurasian Golden Oriole sings, closely followed by a Eurasian Blackcap. I am now driving along the dike where the entire flock of, apparently, sun-bathing Bee-eaters takes flight. There is a Black Stork above the riverside willows. The water level is quite high and the flood zone between the river and the dike is mostly under water, attracting birds to search for food. A Black-crowned Night Heron is above us, Purple Heron and Great Egret in the water, followed by Eurasian Coot with a bunch of fluffy, red-headed chicks. 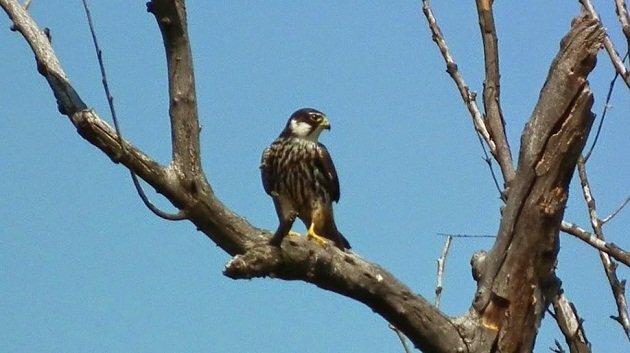 One Eurasian Hobby (cover photo) awaits us at the nearest tree, while a Common Chaffinch sings somewhere from the willows. Sweating profoundly, I am tying a bandana underneath my binocular neck-strap and it barely helps. Ferruginous Ducks swim from cover to cover, one rufous Common Cuckoo female flies from one tree crown to another, a Great Reed Warbler is croaking (what else to expect from a bird that sleeps with frogs? ), while one Western Yellow Wagtail takes flight in front of us. Well hidden, a Song Thrush sings from some nearby cover. 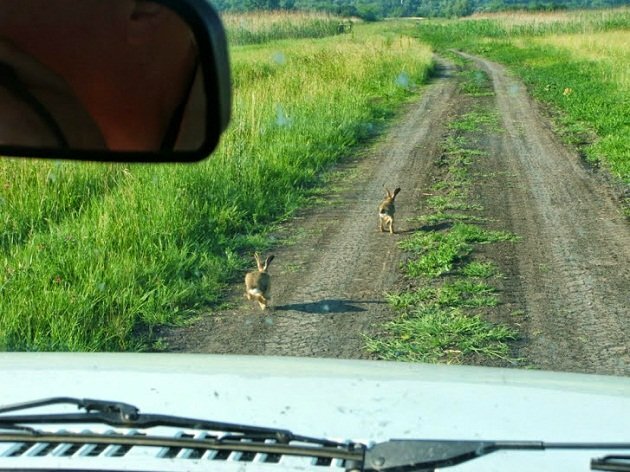 About to leave the dust behind and enter the tarmac, I brake desperately: one silly Hare almost throws itself under my wheels! Not realising that it was in any sort of danger, it stops by the roadside, merely a metre from the car. Where Are You Birding This Final Weekend of June 2014?